From the South/East. Take the South circular A205, follow signs for Putney Bridge A219, cross the bridge and follow signs for Hammersmith for half a mile, take a left into Bishops Park Road, then right at the end. From the West. 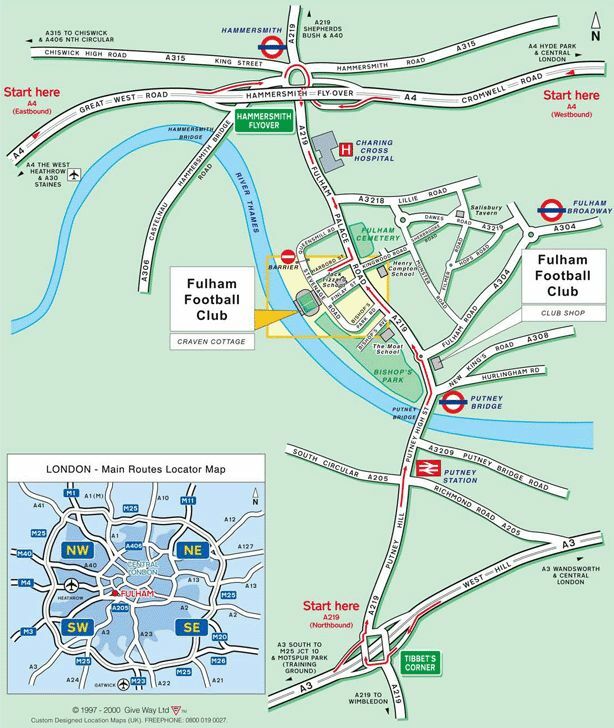 Take the M4 to the A4, after two miles branch left into Hammersmith Broadway, then follow signs for Fulham, turn right after 1 mile into Harboard Street then left at the end for the ground. Parking is possible in the streets around the ground but they are controlled by council parking meters, so make sure you bring some change, (£1.40 per hour) and early arrival is advised. Parking though is free in these areas in the evenings and on Sundays. A trip to Fulham's Craven Cottage is always one of the highlights of the season. The ground has a really traditional feel, with the Cottage still found in one corner of the ground. The new Putney End Stand on the river side of the ground holds the away fans. The allocation is usually the standard 3,000 seats, with the other half of the stand allocated to "neutral" fans - when we're in town this is mostly full of Reds. Smoking is not allowed in the stands at your seat. As with many London grounds, many supporters choose to drink elsewhere before getting the tube in. That may be a mistake at Fulham though as there's plenty of decent pubs to choose from. The most popular establishment with many of the RAWK away crew is the Eight Bells outside Putney Bridge tube station. 2-3 seasons back you'd have found Les Dennis hoping for a quiet pint, getting serenaded by a hundred scousers pre-match. Some of the pubs nearest the ground are designated home supporters only (The Golden Lion, The Cottage), so many fans head across Putney Bridge to the south bank of the Thames where there are plenty of options such as The Dukes Head overlooking the river (20 mins walk). The boys at TOOFIF recommend The Crabtree on Rainville Road as an excellent place to go for a chat and a pre-match pint with Fulham fans. The Zulu Bar isn't a displaced Birmingham hooligans hang-out but a pub on Fulham High Street formerly known as the Kings Head, which welcomes both home and away fans. There's also an O'Neills on Fulham High Street which is popular with Reds. One F In Fulham Fanzine: £2. Does anyone know how you go about buying tickets in the "neutral half" of the Putney End? Do you have to buy them on the day from the ground? How long does it take to get from Euston to the ground via the tube? I'd say about an hour. Cheers, looks like the train getting in at 14:00 will be pushing it. Entering the Stadium – to enter the stadium you need to put the bar code-end of your ticket face up in to the mouth of the plastic bar code reader. Once the green light shows you push the turnstile and enter the stadium. District Line: Going towards Wimbledon, get off at Putney Bridge. Took 60 minutes. Going over with good friends to see Fulham - LFC in April. If I'm not mistaken, we're gonna stay at a hotel with the closest to underground being Russel Square. So let me see if I got this right, we can/should take the "blue" line to Hammersmith? I was initially thinking about the "green" line, as that would take us to Putney Bridge, and, more importantly, the Eight Bells . But that looks like it would involve changing lines. Ergo, the "blue" line would be the easiest, no? From Russell Square, DARK Blue is the Piccadilly line. Take train to Earls Court (direction Heathrow or Uxbridge), change to the DARK Green District Line and get on a train that terminates at Wimbledon (trains display the LAST station they are going to, on the front, so as long as it goes through the station you want, you can get on it). GET OFF AT FULHAM BROADWAY and turn right. Walk for about 20 mins. so how many is that then bout 5000 ticket allocation? no no neutral end. i will have a spare should you want it? People gonna head to the Eight Bells then? Yes, heading there at about 1:30 ish. for those travelling by tube just be aware that the district line is closed between earls court and whitecapel. its still operting from earls court to putney bridge. for those coming via euston there are ways around it but dont go down to victoria station to change. best to check with tube staff. Alternatively, you can get the Hammersmith and City (Pink) line round to Hammersmith and wonder down Fulham Palace Road. Tends to be a lot quicker than the District line, which is quite possibly the worst line in the world. A couple of good pubs on my road, Munster Road, and Fulham Road at the bottom of Munster. The Eight Bells is a good pub. The landlady is a red and last year there was great drink and sing until late after the match - still going strong when we rolled out of there about 11ish. As a kid, weren't the square crash barriers just so much better? Travel time drawing closer and I'm a happy little boy. So, some RAWKites to be expected at The Eight Bells then? yeah ... we'll definitely be there around 1'sh. Just discovered I have to go to a wine tasting with work tomorrow morning, so I am likely to be slightly unsteady by the time the game ends. Spare ticket if anyone wants to go to a wine tasting! Anyone know what our allocation was for this one last year? 1. Am I in the Neutral Section or our section? 2. Is Row BB not obscured by the posts? I was in P3 last year and it was the neutral section - seemed full of our supporters though to me. Only difference seemed to be that people in the neutral side either wouldn't stand or were in the minority and so told to sit down by stewards, whereas across the aisle in the 'away' section everyone was up and bouncing. Thanks for that. Glad that although it is "neutral" it'll be full of Reds. Really looking forward to this one if I can find myself a ticket or two. Either way, big big game! Late night Saturday and all day Sunday - Diversions in the Northampton area. From 20.00hrs on Saturday approximately and all day Sunday, services will be divertedin the Northampton - Wolverton area. Services affected: London-Birmingham-Wolverhampton London-Manchester London-Crewe-Liverpool London-The North West-Glasgow. On Saturday 4th April the District line will be suspended between Wimbledon Park and Wimbledon. A rail replacement bus service will be provided. This section is AFTER Fulham Broadway so majority of us are unaffected by this. From Hammersmith - Catch either of the following numbers which run down Fulham Palace Road: No's 190, 211, 295, 220. From Putney - Catch either the No 74 or the 220 to Fulham Palace Road. Putney End Stand houses the AWAY and NEUTRAL supporters. The Stand was re-developed in 2004 to a covered all-seater stand, having previously been an open standing terrace. The Stand layout varies, but is generally half filled with away supporters (P4-P7), and neutral supporters (P1-P3). The neutral area is suited to supporters with no affiliation or for home and away supporters who are happy to sit together. The front rows, seats 1-6 are uncovered, the rows are then labelled from “A” up to the back row “UU” and offer covered seating (53 rows in total). Entering the Stadium – to enter the stadium you need to hold the bar code on your ticket face up in to the mouth of the plastic bar code reader. Once the green light shows you push the turnstile and enter the stadium. Eight Bells 89 Fulham High Street, near Putney Bridge Tube. We've got tix for the riverside stand,left from our stand. What's it like in there as I think I can't control myself when we score. Normally pretty quiet there, the louder Fulham fans (the 4 of them) are in the other end. Good old fashioned ground this is. Nice walk from the pub to the ground too. Just a shame they charge over the odds.